We create websites that engage, empower, and guide users through the buying journey. Talk to us about building a powerful web presence for your organization. Most websites don't reflect the way people and businesses buy things today. Prospects expect to find just about all the information they need before they ever fill out a form or pick up the phone. We build on the principles of inbound marketing to turn your website into a 24/7 marketing and sales machine – letting customers explore you and your products or services the way they want to. Nordic is one of the top-performing health IT consultancies in the nation. In 2016, company personnel decided it was time their website reflected that. 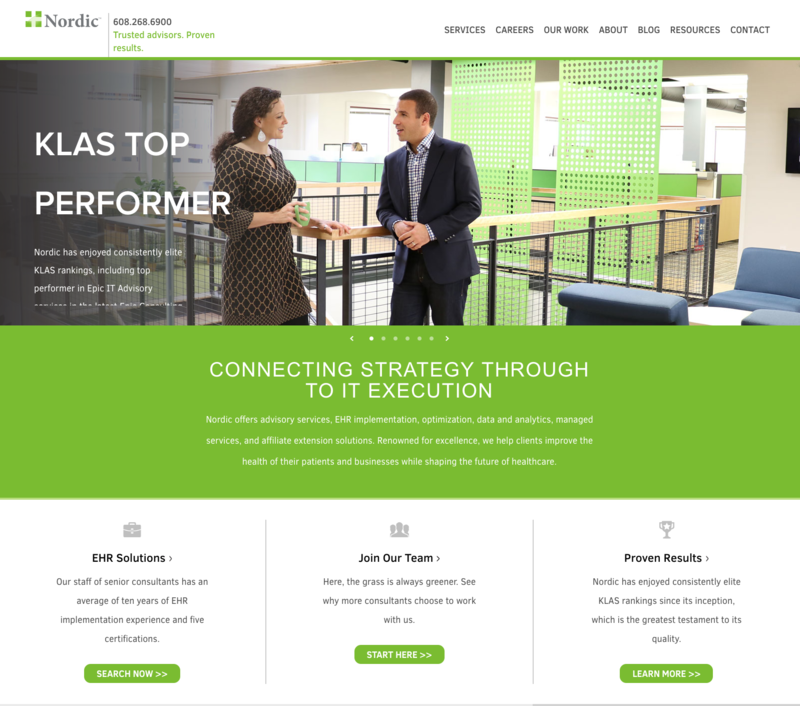 They approached us with a challenge: design and build a site that offered amazing experiences for both prospective clients and consultants while simplifying a diverse array of service areas and resources. Our concept borrowed the best elements from an already-strong brand identity and gave them the home they deserved – a website that made the user’s journey simple and intuitive no matter who they were, or what they were there for. Making the complex simple required a few creative solutions. Unique menu treatments, for example, turned messy sub-navigation into something flat, fast, and beautiful. Spacing and linear formatting helped communicate complicated services in clear and concise terms. Since going live in 2017, we’ve continued to implement further enhancements based on the principles of Data-Driven Design – learning how visitors interact with the site through tools like heat mapping and optimizing accordingly. The website needed to serve two radically different audiences: prospective clients (healthcare systems) and consultant candidates looking for work. Healthcare systems are there to learn what types of health IT Nordic can help with while being able to drill into the details of each of those services. To overcome this challenge, we drew a clear distinction directly in the main menu and homepage, with separate custom designs to give each area a user experience that was quick, easy, and informative. Company blogs have evolved quite a bit over the years. Designers have learned, for example, that cramming a sidebar with a giant list of categories, posts published each month, and keyword tags don’t give readers the best user experience. They want something simple, easy, and intuitive. To bring Nordic’s blog out of the past, we eliminated the sidebar entirely. Instead of combing through endless keyword tags and categories, users can now filter posts by the five core subjects it tackles. We also replaced the traditional blog “feed”(one post after another, in chronological order) with post snippets laid out on a simple, easy-to-use grid. We also improved the layout of blog posts themselves. Cluttered sidebars and deprecated formatting transformed into a simple, distraction-free reading experience. 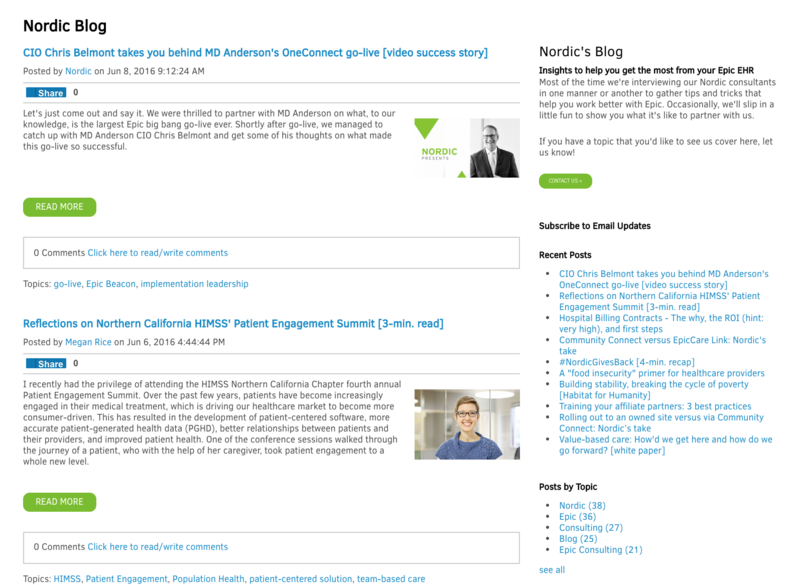 Nordic’s service line reflects the complexity of the health IT world. Not only are there many services, but multiple categories these services are nested under. 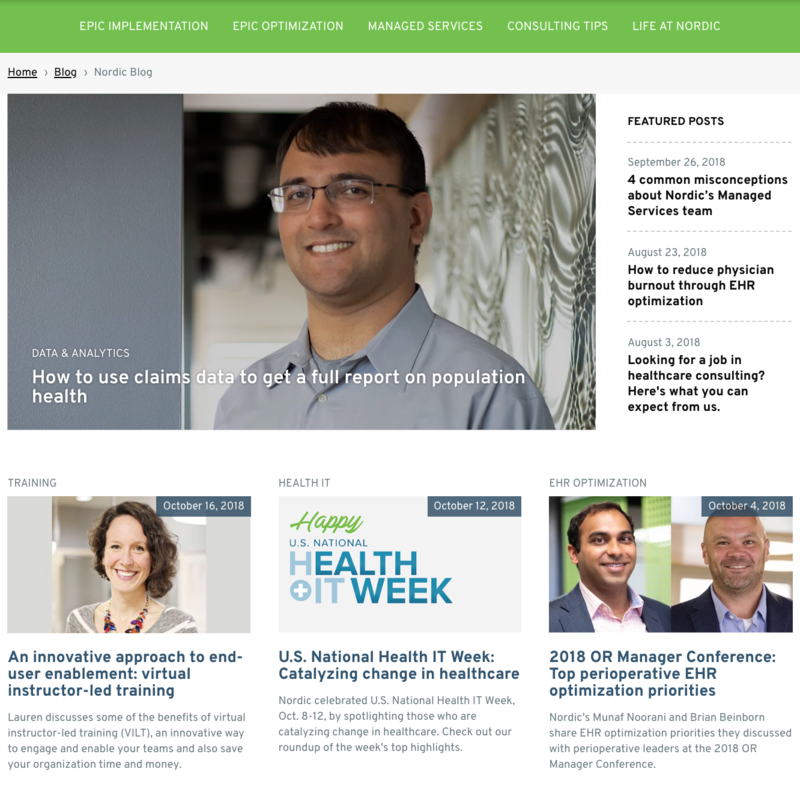 All these capabilities are great for healthcare organizations but tough for web designers! To solve the problem of fitting so much into a small space while making it easy to navigate, we created a unique menu design that offered us more digital real estate. This enabled us to display the services under their core categories, eliminating the need for frustrating sub-navigation menus. Need a website built for business? Talk to us about creating a red-carpet experience for prospects and customers.